Carson St. Clair is a Seattle native and she’s been shaking up this town her whole life. Se had already studied conducting and dance, theater and choir and, oh yeah … violin! before attending Miss Indigo Blue’s Academy of Burlesque. 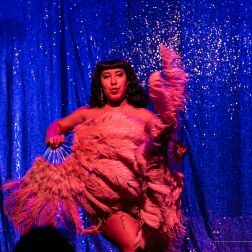 Now, among other names, she’s known as “The Petite Provocateur”, she’s performed at the Smith Tower Club, The Pink Door, The Jewelbox Theater and has worked with several other Seattle shows including work as an apprenticeship with The Emerald City Burlesque Revue. Carson is also one of six proud members of Dark Diamonds Burlesque, Seattle’s all POC ensemble. This spring she will grace our stage at Moisture Festival 2019!